These look good enough to eat! Your highlights are amazing. You are oh so good at this. 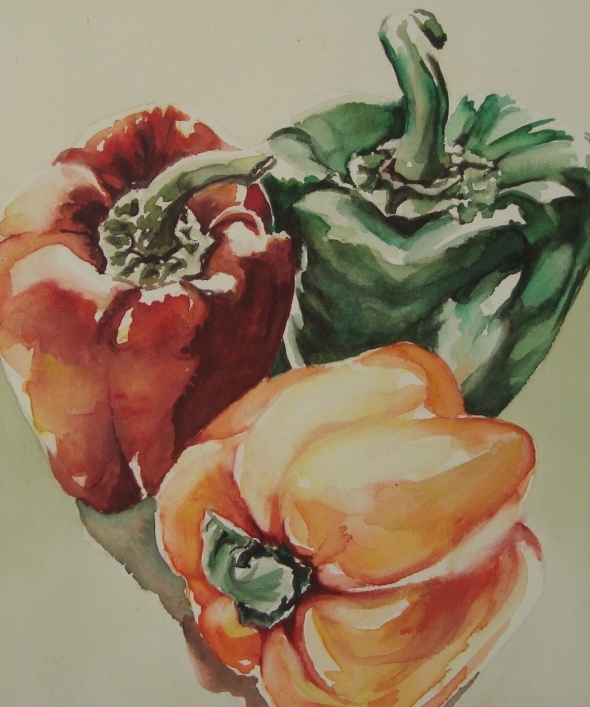 they are the most beautiful peppers I've ever seen painted! Wow! Good! Wow! Really good. HPPF. oh boy, these are wonderful - it looks like you could just reach out and pick them up! Love the peppers and the way you captured the light. Happy PPF! The artwork is stunning, and I love the quote! These are really brilliant ... love 'em. The quote is so right though ... you must have great fun finding them. What a wonderful trio...love it! you are the best artist ever, seriously Minn. You capture light on objects like no other. you amaze me my friend. Hello Minnemie:) I love your peppers. So nice and realistic! Great job! Oh so GORGEOUS- I love this! The way you have caught the light makes them look so real. Amazing! these look yummy enough to eat! Love it! Wonderful rendition of peppers, you really have lots of talent. You pepper painting is so very gorgeous! Love seeing your new paintings each Friday! Delicious and fresh, awesomely rendered! i love food paintings! and I like your peppers. Yum! I can smell them from here. Beautiful! That would look great on my dining room wall. I love gorgeous art in the dining room. Love the tone set in this painting. Wonderful! Fabulous art! Makes me want to make a Greek salad at midnight!! Mmmm, those colors look good. I think you've really captured the character of those peppers. super painting - the depth of your colors is amazing. you should do the interview for PPF! Your peppers and your quote, so eloquently complement each other! They both are just perfect!!! Beautiful still life. Happy Painting.